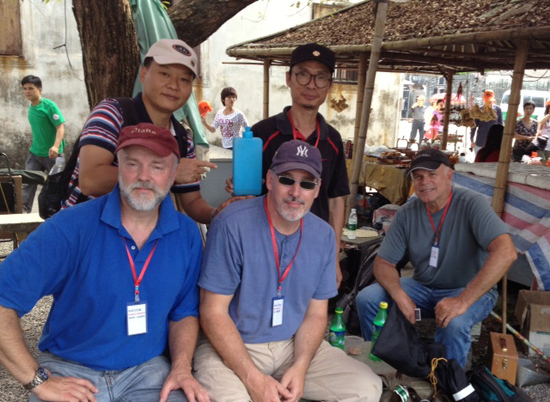 This was my second visit to Southern China. 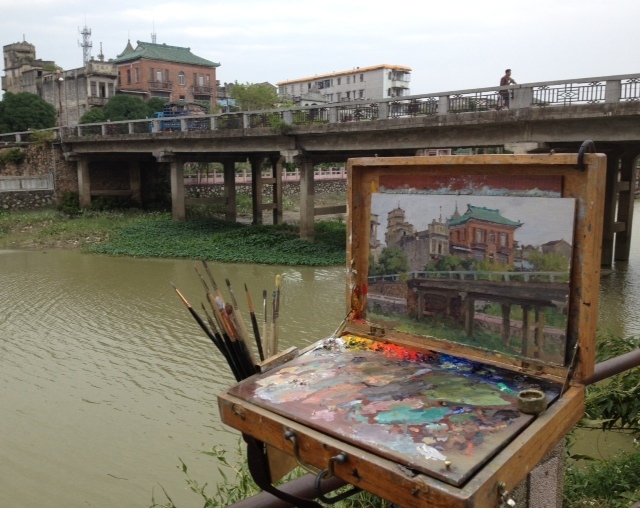 Our group was lead by the talented artist Jason Situ who is in fact from the region and we were hosted by the Kaiping Art Museum. Ten artists rounded out the group and included good friends Andy Evansen, John Cosby, Jack Dant and Andrew Lattimore. The challenges presented by the food were more than compensated for by the warmth of the people and the target-rich painting environment. My first afternoon painting directly followed 36 hours of travel so I was a bit loopy to begin with. It was hot & humid so I set up in the shade on the sidewalk along the Pearl River. My friends from the Museum assured me I was good to go so I went to work. 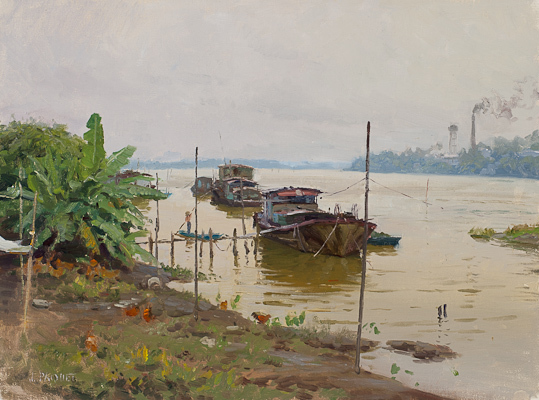 Within the hour bikes and motorized contraptions of all shapes and sizes started pulling up and unloading baskets of living things for sale: fish, eels, frogs and snakes splashed and squirmed around the ever-shrinking island that was my easel. The entire sidewalk was reanimated and alive. The fish market was in full-swing and I was along for the ride. A large fish leaped from it's basket striking me in the knee which amused the locals greatly. Cleavers and fish guts flew in all directions while I lamely tried to cling to a light-effect, all the while aware of a snapping sound which was unfamiliar to me. Behind and to my right sitting cross-legged was an old man expertly removing poisonous snakes from a burlap bag -- tail first. When his grip was a foot or so from the jaws he would whip it out of the bag and spin it in the air above his head, snapping it's head on the sidewalk (an under-appreciated talent). You know you're out of your element when the only one surprised by this is you. And so the week went. We were escorted through the southern China by museum staff, professional and amateur artists, art professors and the generally curious. We shared mystery meals, karaoke and a love of art. Everywhere I went I was struck by the fact that most everyone was intensely involved in the business of simply getting by. Young and old worked side by side with all generations involved. The old river boats particularly intrigued me; extended families, including livestock, shared the same space -- seemingly peacefully. I focused a good deal of my time recording them as they are fated to disappear. Not part of China's vision of the future I suppose. Sad. At the end of our visit and thanks to the director Mr. Shea we had a showing of our efforts at the new Kaiping art Museum -- a beautiful building. The Museum purchased a work from each of us for their collection. A great honor and surprise. , however briefly, the way another culture lives and wonder at the fact that these people would share anything they have -- no matter how little, and a measure of sadness at the beauty of the simple things we have forgotten in our quest for having more. 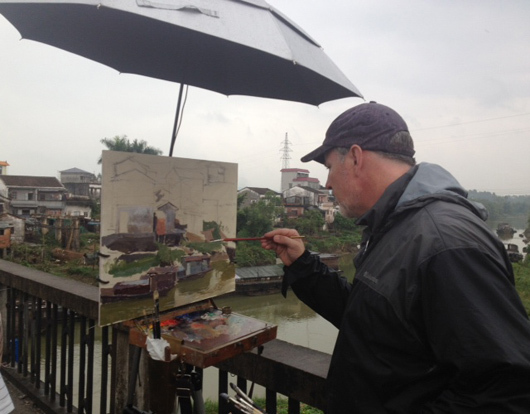 Thank you Jason and all my friends at the Kaiping Art Museum who made this extraordinary trip possible. This will be my 6th year teaching on the island and I can't imagine a better place to be in the during the Winter season. All skill levels welcome. 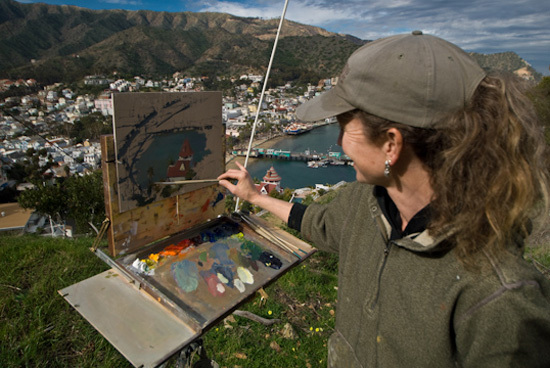 We have the incredible Hotel Portofino across from the beach and in the morning you can grab your coffee from the lobby, walk across the street with your gear and paint. I am still looking for a space so will keep you posted regarding classes and workshops for the Spring. Since I have my current space until the end of February I will most likely be teaching classes for that month.